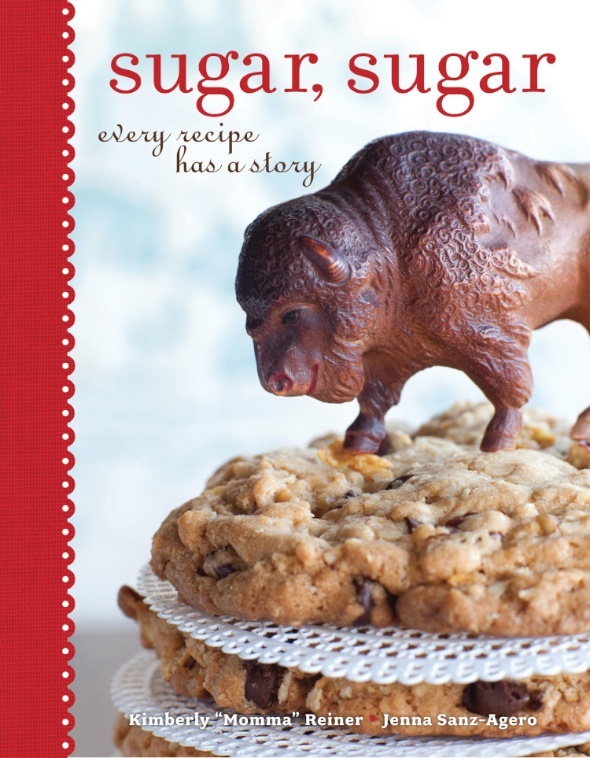 All photos courtesy of their respective publishers..
To me, pecans are the sweetest and softest of nuts. There’s something quite decadent and dessert-y about them; I shudder when I see them in savory applications. This reaction, I think, stems from my love of gooey, nutty pecan pie. If you want to gild the lily, drizzle the top of each pie with melted chocolate, or put a pat of Bittersweet Ganache Filling at the bottom of the cup for a delicious surprise. These pies can also be made in jars. Makes 12 to 16 pies. Have two 12-cup standard muffin tins ready. Remove the dough from the refrigerator. Lightly flour a clean work surface. Unwrap the dough, place it on the floured work surface, and flour the top lightly. Roll out the dough into a large circle about 1/8-inch thick. It will be about 14 inches in diameter. Using a round biscuit or cookie cutter, cut out as many circles 4 to 5 inches in diameter as possible. Handling the dough circles gently, lift each circle and press it into a muffin cup, leaving a 1/8- to 1/4-inch overhang and patching any tears by pinching them together or plugging them with a dough scrap. You can crimp the dough that extends beyond the edge of the cup with fork tines or your fingers so it adheres to the top of the tin and forms a rim, if you like, but it is not necessary. Gather the dough scraps, form into a ball, and roll out, and cut out more circles. (Reroll the dough only once or it will bake up tough.) You should have 12 to 16 circles total. If you don’t have enough dough circles to fill every cup in a muffin tin, stagger the crusts, rather than clustering all of them at one end of the tin. If you’ve filled one tin, refrigerate it while you line the cups in a second tin, then refrigerate the second tin. In a bowl, whisk together the eggs, brown sugar, and corn syrup until light in color. Whisk in the bourbon and orange zest (if using) and then whisk in the vanilla and salt. Stir in the pecans. Remove the dough-lined cups from the refrigerator. Fill each cup two-thirds full with the pecan mixture. Refrigerate the assembled pies for 30 minutes. Preheat the oven to 350 degrees. Bake the pies until the filling is golden brown and no longer jiggles when tapped, about 15 minutes. Let cool on a baking rack for at least 1 hour before serving. 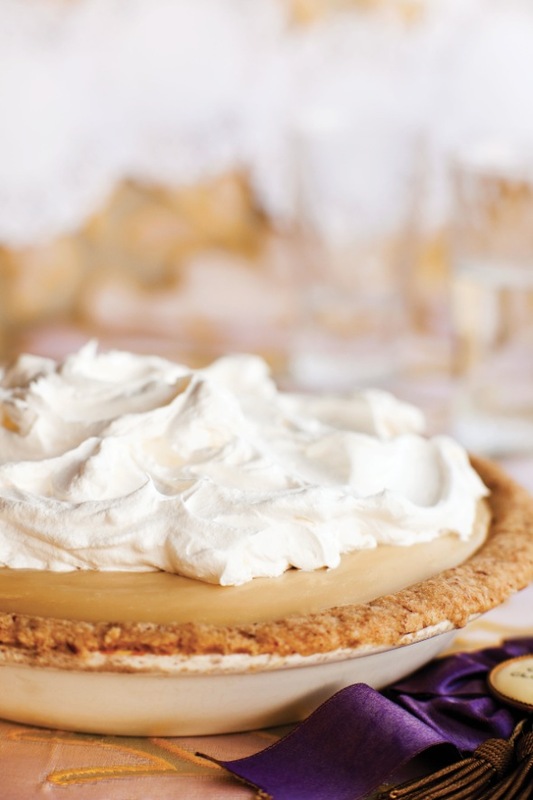 Run a sharp, thin knife around the edge of each pie to loosen it from the cup. Then, using the knife tip or a fork, gently pry each pie upward so you can grab it with your fingertips and lift it out of the tin. Serve warm or at room temperature. The pies can be stored in an airtight container at room temperature for up to 3 days or frozen for up to 2 months. Reheat in a 350-degree oven for about 5 to 7 minutes. Handling the dough circles gently, lift each circle and press it into a muffin cup, leaving a 1/8- to 1/4-inch overhang and patching any tears by pinching them together or plugging them with a dough scrap. You can crimp the dough that extends beyond the edge of the cup with fork tines or your fingers so it adheres to the top of the tin and forms a rim, if you like, but it is not necessary. Gather the dough scraps, form into a ball, and roll out and cut out more circles. (Reroll the dough only once or it will bake up tough.) You should have 12 to 16 circles total. If you don’t have enough dough circles to fill every cup in a muffin tin, stagger the crusts rather than clustering all of them at one end of the tin. If you’ve filled one tin, refrigerate it while you line the cups in a second tin, then refrigerate the second tin. Refrigerate the lined cups for 30 minutes. Preheat the oven to 400 degrees. Remove from the dough-lined cups from the refrigerator. Line each cup with parchment paper, extending it beyond the rim, and fill with pie weights. Place in oven, and bake until the pastry is pale gold, about 10 minutes. Remove from the oven and place on a baking rack. Remove the weights and parchment and let the crusts cool for at least 15 minutes before filling. In a bowl, whisk together the pumpkin, eggs, brown sugar, milk, sour cream, butter, vanilla, cinnamon, ginger, nutmeg, and salt until smooth. Fill each cooled pastry cup two-thirds full with the pumpkin mixture. Bake in the oven for 10 minutes. Reduce the oven temperature to 325 degrees and continue to bake until the tip of a sharp knife inserted into the center of a pie comes out clean, 12 to 15 minutes longer. The pies are ready if the filling jiggles slightly when a tin is gently shaken. Let cool completely in the tin(s) on a baking rack, at least 2 hours. The pies should easily lift from the cups when cool. Use a knife tip or fork to pry each pie gently upward so you can grab it with your fingertips and lift it out of the tin. Serve at room temperature. The pies can be kept in an airtight container at room temperature for up to 2 days or frozen for up to 2 months. Reheat in a 350-degree oven for about 10 minutes. In September hard fruits replace soft fruits in our markets. We even see local apples as early as August, but September marks their true arrival. Local Golden Delicious is our apple of choice. It’s a little low on acid, but we love its sweet perfume in this tart. Serves 6 to 8. For the pastry dough, whisk the flour, salt, and sugar in a mixing bowl. Cut in both butters and the shortening with a pastry blender or a fork until crumbly. It should resemble coarse cornmeal. Sprinkle in 3 tablespoons ice water and toss together lightly until the dough comes together (add a little more ice water if you need to). Shape the dough into a flat rectangle (don’t overhandle). Wrap the dough in plastic wrap, and chill for at least 1 hour. Preheat the oven to 375 degrees. Roll out the dough into a large rectangle on a lightly floured surface. It should be about ⅛ inch thick and fit into a 9 °—13-inch baking sheet. Roll the dough loosely around the rolling pin, then unfurl it into the baking sheet. Lightly press the dough into the pan, leaving ½ inch of dough hanging over the edge. Trim any excess off with a sharp knife. Tuck the dough under itself to make a nice edge. For the apple filling, mix 2 tablespoons of the sugar and the cinnamon together in a small bowl. Put the apples into a large mixing bowl, sprinkle with the cinnamon sugar, then add the cream and toss everything together. Arrange the apples in an even layer on the pastry. Bake until the apples are soft, 45–55 minutes. 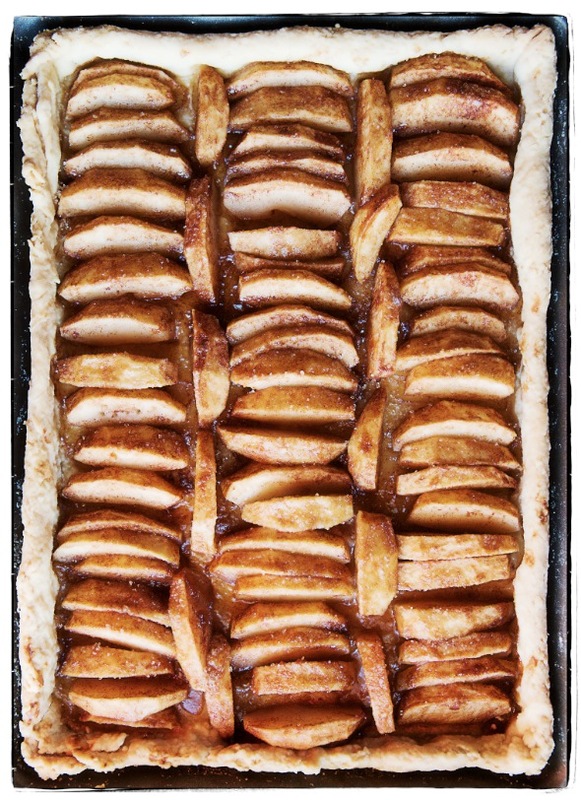 Remove from the oven and sprinkle the apples with the remaining 1 tablespoon of Demerara sugar. Our friend Karen Bates of famed Philo Apple Farm in Northern California taught us that. . . Early apples tend to break down very easily—great for applesauce and very tender juicy pies, but the apples lose their shape. Midseason apples generally cook up fairly tender and hold their shape with more integrity, so the choice is mostly about flavor. Late season apples can border on being a little too firm with much less juiciness. So make your applesauce early in the season and keep your late apples as long as you can—they store beautifully all winter long. 1. 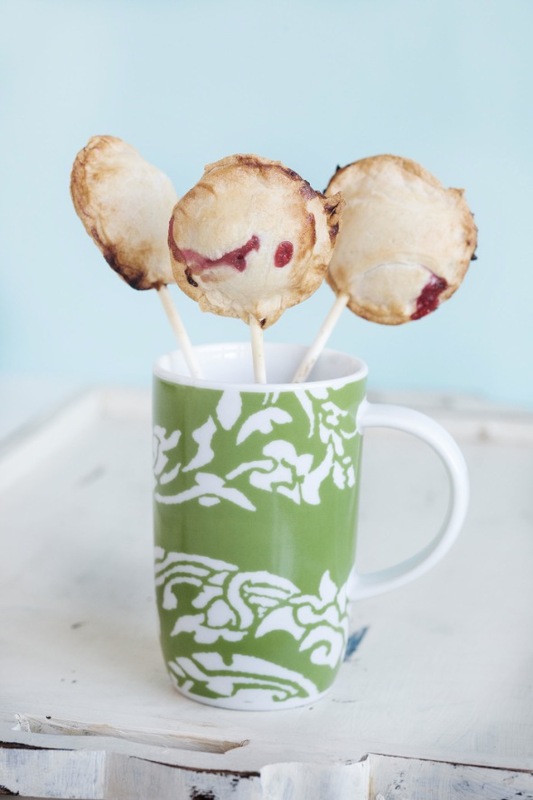 To make the mini cherry pies, preheat the oven to 375°F and grease a 24-cup miniature muffin tin. Use a rolling pin to roll out the pie crust dough on a lightly floured smooth surface until the dough is about 1/8-inch thick. Then use a 2½-inch circular cookie cutter to cut out 48 small circles. 2. Press the dough circles into the prepared tin and fill them three-quarters full of cherry pie filling. Top each pie with another dough circle, sealing the pies by pinching the edges of the bottom crust to the top crust. Use a sharp knife to cut a small X into the top of each pie. Bake the pies for 10 to 12 minutes, until the edges of the crust have browned. They may overflow a bit, and that’s okay. They don’t have to look perfect since they’re going into a cupcake! Allow the pies to cool for 10 minutes in the tin and then carefully transfer them to a wire rack to finish cooling while you mix the cupcake batter. 3. 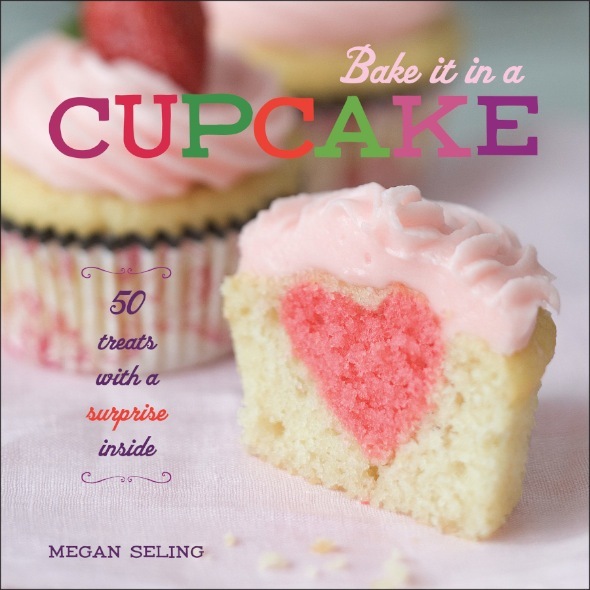 To make the cupcakes, turn the oven temperature down to 350 degrees. Line 2 standard muffin tins with 24 paper liners. Place the chocolate and 2 tablespoons of the milk in a small microwave-safe bowl and microwave for 20 seconds on high. Stir and microwave for another 20 seconds. Stir the mixture until the chocolate has melted completely and the cream is fully incorporated. Place the bowl in the refrigerator so it can cool while you prepare the rest of the cupcake batter. Use a stand mixer fitted with the paddle attachment or a hand mixer on medium speed to combine the butter and sugar for 90 seconds, until fluffy. Add the eggs, one at a time, mixing in each egg completely before adding the next. Use a spatula to scrape down the sides of the bowl. Then, with the mixer on medium-low speed, add the vanilla, baking powder, baking soda, and salt. Add the cocoa powder. Turn the mixer up to medium-high speed and mix for an additional 30 seconds, until all the ingredients are well combined. Scrape down the sides of the bowl and then add the flour, 1/2 cup at a time, alternately with the milk, 1/3 cup at a time, mixing until each addition is completely incorporated before adding the next. Finally, with the mixer on medium-high, drizzle in the cooled chocolate mixture. Continue to mix the batter on medium-high speed for 30 seconds, until smooth and creamy. 4. Spoon a heaping tablespoon of batter into each cup in the prepared tins. Place a cooled cherry pie into the center of the batter and press it gently toward the bottom. Cover the pie with another heaping tablespoon of batter so the top and sides are completely covered and the cup is about three-quarters full. Bake for about 25 minutes, until the edges and tops of the cupcakes have set and the cake springs back when you gently press your finger into the top of it. Allow the cupcakes to cool in the tins for at least 10 minutes before moving to a wire rack to cool completely. 5. For the frosting, whip the butter for about 30 seconds with a stand mixer fitted with the whisk attachment or a hand mixer on medium speed. Add the powdered sugar, 1/2 cup at a time, whipping on medium-high speed until fluffy. Add the vanilla seeds and whip until just combined. If the frosting is too thick, add the milk and whip on high for 20 seconds. 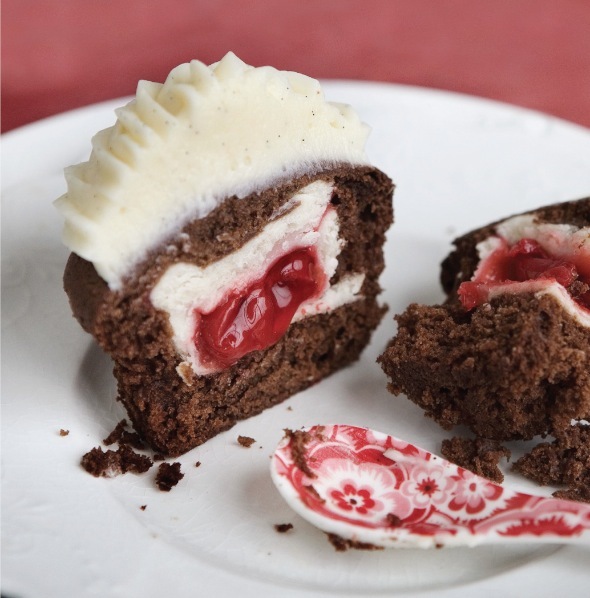 Pipe or spread the frosting on top of the cooled cupcakes. Top each cupcake with a cherry. The Classic lunchtime sandwich becomes a crowd-pleasing dessert! Try it with a Graham Cracker Crust, and even use some cinnamon or chocolate grahams. You won’t want to cut the crusts off! Make up a half recipe of the crust, because this is a single-crust pie. Makes 1 Single-Crust 9-inch Pie (or 1 Single-Crust 7-inch Deep-Dish Pie, 18 Petit-5s). Preheat the oven to 375 degrees. Place a rack in the center of the oven. To make the crust, follow the All-Butter Crust recipe (making one-half of the recipe) and roll out the dough per the instructions. Gently drape one edge of the rolled-out dough circle over the rolling pin, and revolve the rolling pin to wrap the whole crust around it. Place the rolling pin over the edge of the pie plate or tin, and carefully unroll the dough over to the other edge of the pie plate so the dough circle is centered. Press the dough gently into the bottom of the pie plate and around the sides. Trim the dough edge to a 1/2 to 1-inch overhang beyond the rim of the pie plate. Go around the pie and use the fold-tuck-crimp method to seal the pie edge: Starting in any spot, use the fingers of both hands to gently press and fold over the overhanging crust and tuck it under at the outer edge of the pie. Then, to crimp, using the forefinger of your left hand and the thumb and forefinger of your right hand, go around the pie edge and press in with the left forefinger and simultaneously outward with the right thumb and forefinger. Or alternately, instead of crimping, after you fold-and-tuck, use a fork and press the back side of the fork prongs into the pie edge all around the rim. Line the pie crust with parchment paper and fill with pie weights or dry beans. Bake for about 30 minutes, or until the crust is golden brown. Remove the weights, and let cool. To make the filling, in a large bowl, with a spoon or an electric mixer, stir together the cream cheese, peanut butter, 1/2 cup of the sugar, the milk, honey, and salt until well combined. 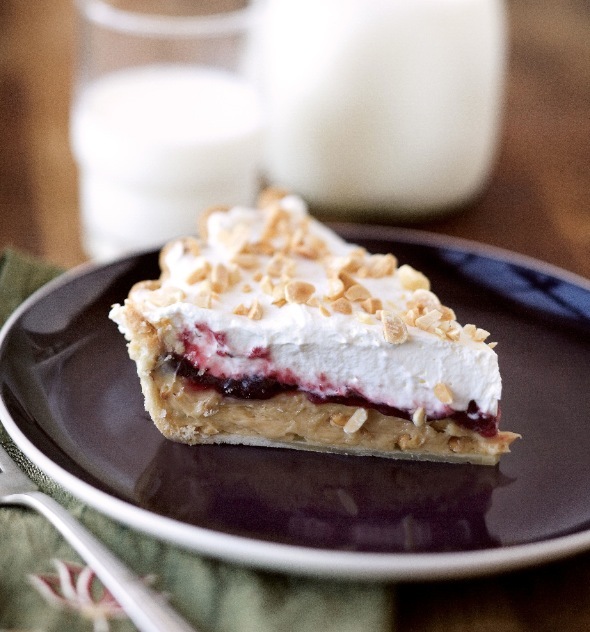 Spoon the peanut butter mixture into the crust and spread evenly over the bottom. Spoon the jelly onto the peanut butter layer, and spread it evenly on top. 9. In a medium bowl with an electric mixer, whip the whipping cream, the remaining 3 tablespoons of sugar, and the vanilla until soft peaks form. Top the jelly layer with the whipping cream, as thick or as thin as you like (I recommend 1 to 2 inches). Sprinkle with some peanuts and just a few raspberries (or whatever fruit the jelly contains), for garnish. Note: We use raspberry jelly at High 5 Pie, but you can use your favorite. In a large bowl, combine the flour, salt, and sugar and mix well. When you’re ready to use the dough, let it sit at room temperature for at least 10 minutes to soften it and make it workable. On a lightly floured surface, roll out each of the 2 dough patties to about a 1/4-inch thickness, lightly dusting it with flour, if needed, to prevent sticking, and making sure to roll the dough evenly. High 5 Pie’s take on a classic cherry pie, this delicious version features almonds, cinnamon, and a pinch of allspice. This recipe was one of the very first we introduced upon launching the business, and it’s been a top-seller ever since. 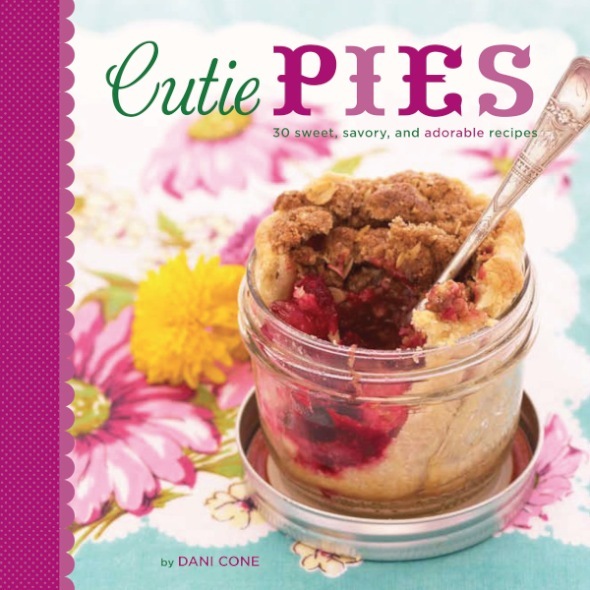 We also feature it in full-sized pies, Cutie Pies, Piejars, and Flipsides, so try them all! 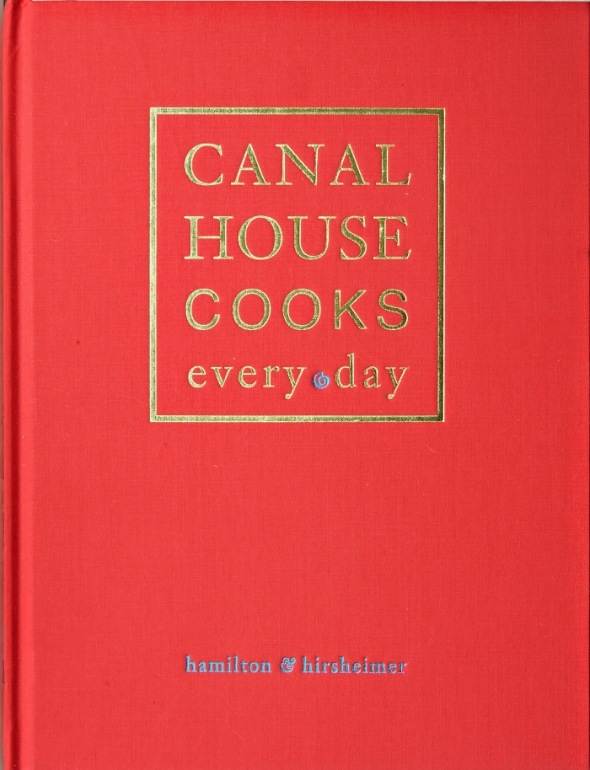 It’s a terrific year-round, any-occasion recipe. Consider it a new classic. Makes 50 Piepops (or 1 double-crust 9-inch pie, 1 double-crust 7-inch deep-dish pie, 16 Cutie Pies, 36 Petit-5s, 8 Piejars, 10 Flips ides). 1. Preheat the oven to 375°F. Place a rack in the center of the oven. Lightly spray the baking sheets with nonstick pan spray. 2. To make the filling, in a large bowl, combine the cherries, vanilla, and almond extract. 3. In a small bowl, mix together the sugar, cornstarch, cinnamon, allspice, and almonds. 4. Pour the sugar mixture over the cherries, and toss to thoroughly coat. Drain the mixture slightly to avoid having too much liquid. 5. To make the crust, follow the All-Butter Crust recipe and roll out the dough per the instructions. Cut 100 2 ½-inch-diameter circles from the dough. Reroll the dough to make all the circles, making sure to avoid overhandling the dough. 6. Lay half the circles on the prepared baking sheets. Brush the circles lightly with the beaten egg. Place a lollipop stick across the center of the circle, with the tip about ½ inch from the edge. Press the stick gently into place. 7. Spoon about 1 tablespoon of the filling onto each of the dough circles. For each Piepop, lay a circle of dough over the pop, and press firmly around the edge with the tip of your thumb, making a good seal. 8. Cut 3 (1/4-inch) vent slits into the top of each Piepop, and brush lightly with the remaining beaten egg. 9. Bake for 15 minutes, or until golden brown. Repeat with the remaining Piepops. We are here to announce to all of Helen’s relatives, old and young, that this butterscotch pie is a winner. The pecan crust is a pleasant surprise when you bite into it, contrasting with the mellow butterscotch filling. You may want to resurrect El’s recipe and add it to the rotation. Your family and friends will think you invented something new. Accept the praise and offer up another slice. To make the crust: Preheat the oven to 350 degrees. Place the flour, brown sugar, and pecans in the bowl of a food processor. Pulse a few times to mix. Add the butter and pulse several times until it is well incorporated and the mixture forms moist crumbs. Press the mixture firmly and evenly in the bottom and up the sides of a 9-inch pie plate. Bake for about 20 minutes, until the crust begins to turn golden in the center. Remove from the oven and set aside to let cool. To make the filling: Place the sugar, flour, and salt in a large saucepan over medium heat. Gradually stir in the milk and continue stirring for 8 to 10 minutes, until the mixture begins to thicken. The consistency should be like a thick cream soup. In a small bowl, whisk the egg yolks. To temper the eggs, pour about 1 cup of the hot, thickened milk mixture into the bowl of yolks. Quickly whisk together and then slowly blend the egg mixture back into the hot milk in your saucepan, stirring continuously. Decrease the heat to low and cook for 1 minute longer, stirring constantly, until the mixture takes on the consistency of pudding. Remove from the heat. Stir in the butter until melted, then stir in the vanilla. Allow the filling to cool in the pan for about 5 minutes, stirring occasionally to prevent a skin from forming. Pour the filling into the cooled crust and chill for 4 hours to overnight. Serve alone or topped with the Rum Cream Topping that follows. In the bowl of a stand mixer fitted with the whisk attachment, whip the cream on high speed until it begins to stiffen. Add the sugar and rum and beat until soft peaks form. Sass it up: Go a little “nuts” and sprinkle some chopped pecans on top of the pie. According to Sandi, Granny Helen was a natural cook but did not pass on her culinary talents to her daughter Eileen (Sandi’s mother). Dad did the cooking in Sandi’s family. However, there are some things only a mom can do…like mend a broken heart. The only time Eileen ventured into the kitchen was to create her cure-all elixir, grasshopper pie. The pie, with its bright green filling, was sure to produce a giggle and a smile. It never failed to cheer up the children when their spirits needed lifting. 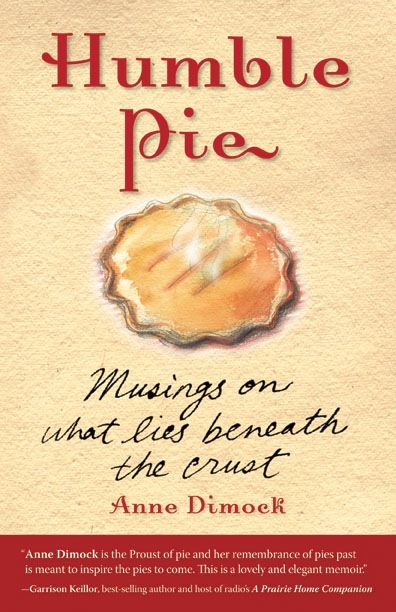 Sandi recalls that the pie appeared when she did not make the cheerleading squad. It also materialized when a boy broke up with her in high school. Sandi ate the entire pie! We’ve all been there. Years later Sandi met John, her future husband. When they began dating, he told Sandi that the one thing he remembered most about his childhood was his mom’s grasshopper pie. What are the odds? Clearly these people were destined for matrimony. It was a green match, and Sandi’s love life came full circle. 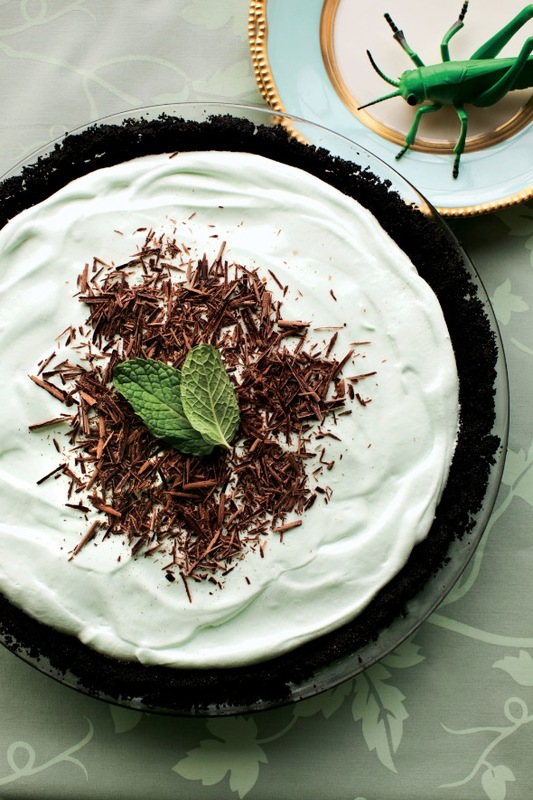 Grasshopper pie is light and buoyant. It gives you the cool, refreshing sensation you get from the mint chip ice cream. Because of the shamrock color, you just can’t take life too seriously while you’re eating it. To make the crust: Preheat the oven to 350 degrees. In the bowl of a food processor, pulse the wafers until crushed. Add the sugar and pulse again. While the machine is on, add the melted butter, starting with 4 tablespoons and adding more only if needed, until a coarse meal forms. Press the mixture firmly and evenly in the bottom and up the sides of a 9-inch pie pan. Bake for 10 minutes to set. Remove from the oven and set aside to let cool. To make the filling: Place the marshmallows and milk in a large saucepan over low heat. Stir constantly with a wooden spoon until melted. Pour the mixture into a small bowl and chill for 30 minutes to 1 hour, until cold. In the bowl of a stand mixer fitted with the whisk attachment, whip the cream until stiff peaks form. Add the drops of food coloring until the cream is bright Kelly green, like a shamrock. Use a spatula to fold in the marshmallow mixture until fully incorporated. Do not beat. Sir in the crème de menthe and crème de cacao. Pour the filling into the crust. Chill for at least 4 hours or up to overnight. 1. 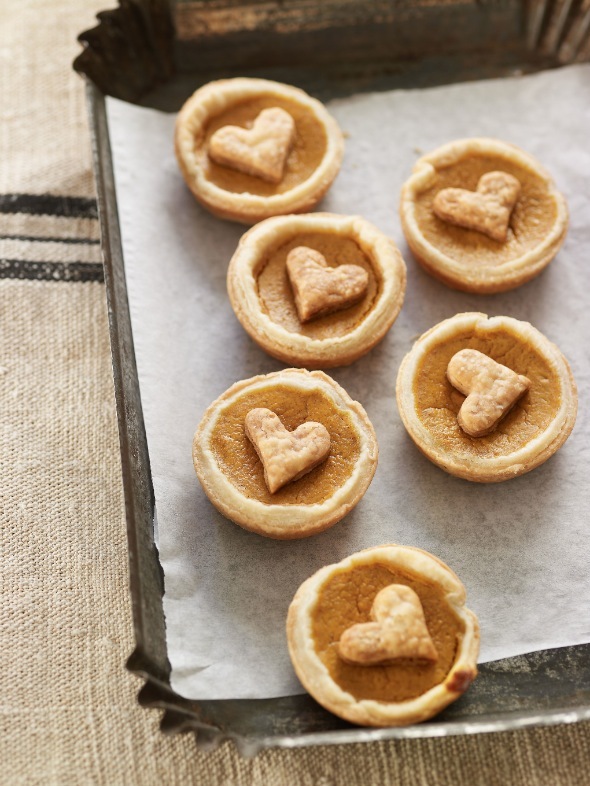 To make the mini pumpkin pies, preheat the oven to 425°F and lightly grease a 24-cup miniature muffin tin. Use a rolling pin to roll out the piecrust dough on a lightly floured smooth surface until the dough is about 1⁄8 inch thick. Then use a 21/2-inch circular cookie cutter to cut out 24 small disks. Ball up the scraps of dough and wrap in plastic wrap for later use. 2. Press the dough circles into each cup in the prepared tin and fill three-quarters full with the prepared pumpkin pie filling. Keep in mind the pumpkin pie filling will expand a bit while baking. Bake the pies for about 7 minutes. With the pies still in the oven, turn the oven down to 350°F and bake for an additional 7 to 10 minutes, until the edges of the crust have browned and the pumpkin pie filling no longer jiggles when you gently shake the tin. Allow the pies to cool for 5 minutes in the tin and then carefully transfer them to a wire rack to finish cooling while you mix the cupcake batter. 3. To make the cupcakes, line 2 standard muffin tins with 24 paper liners. Use a stand mixer fitted with the paddle attachment or a hand mixer on medium speed to combine the butter and cream cheese for about 90 seconds, until smooth. Add the sugar and mix on medium-high until fluffy. Add the eggs, one at a time, mixing in each egg completely before adding the next. With the mixer on medium speed, add the vanilla, baking powder, baking soda, and salt. Finally, add the flour, 1/2 cup at a time, alternately with the milk, 1⁄3 cup at a time, mixing until each addition is fully incorporated before adding the next. Continue to mix the batter on medium-high speed for 30 seconds, until smooth and creamy. 4. Spoon a heaping tablespoon of batter into each cup in the prepared tins. 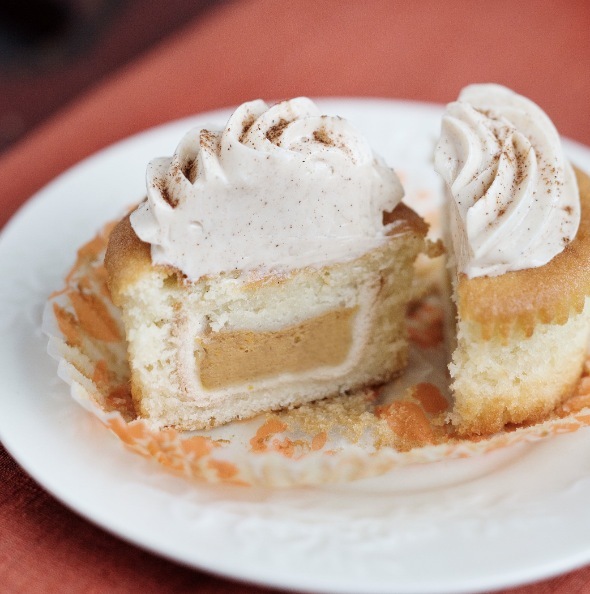 Place a cooled pumpkin pie into the center of the batter and press it gently. You don’t want the pie to touch the bottom of the tin. Cover the pies with another heaping tablespoon of batter so the top and sides of the mini pie are completely covered and the cup is about three-quarters full. Bake for 25 minutes, until the edges and tops of the cupcakes have turned golden brown and the cake springs back when you gently press your finger into the top of it. Allow the cupcakes to cool in the tins for at least 10 minutes before moving to a wire rack to cool completely. 5. To make the frosting, melt the cream and cinnamon chips together in a microwave in a small microwave-safe bowl for about 45 seconds on high. Stir the mixture until all the chips have melted and place in the fridge while you prepare the rest of the frosting. Using a stand mixer fitted with a paddle attachment or a hand mixer, cream together the butter and cream cheese on medium-high speed for about 30 seconds, until smooth. Whip in the powdered sugar, 1/2 cup at a time, until the mixture is fluffy. Finally, with the mixer on low, drizzle in the cinnamon chip mixture. (Make sure it has cooled a bit—if it’s too hot, it will melt the frosting.) Spread or swirl a generous helping of the frosting onto the cupcakes using a spatula or pastry bag. 6. Put the leftover piecrust scraps to good use by making cinnamon-sugar decorations. Mix the sugar and cinnamon in a small bowl. Use a rolling pin to roll out the reserved ball of dough onto a lightly floured smooth surface until it’s about 1⁄8 inch thick, then cut out quarter-sized circles with a small cookie cutter or frosting tip. Place them on a baking sheet, sprinkle them with a little bit of the cinnamon and sugar mixture, and bake for about 10 minutes at 350°F, until they’re golden brown. Once they’re cool, put one on top of each of the cupcakes and serve. Prepare the piecrust and fit into a 9- or 10-inch pie pan. Peel, core, and dice the apples. Place the apple pieces in a large bowl with the cranberries and 1 cup of light brown sugar; mix well and place into the pie shell. Place the walnuts in the bowl of a food processor fitted with the steel blade; pulse for 5 seconds. Add the remaining ingredients and pulse until blended but still crumbly. (If you don’t have a food processor, chop the nuts by hand and blend them with the rest of the ingredients with the back of a large spoon.) Spoon the topping all over the pie. Bake at 425 degrees for 20 minutes, then lower the temperature to 350 degrees for 30 more minutes; cover with foil to prevent the topping from darkening too much.